There is nothing more precious in the world than human relationships. People are social creatures and we show our uniqueness through communication with other people. However, there are certain types of relationships that do not help develop and reveal our personality; moreover, they try to destroy it in any possible way. Such relationships are called toxic, emotionally dependent, symbiotic; and it concerns not only romantic relationships – parents, friends and co-workers can be toxic as well. These are the relationships that do not provide partners with happiness, inner calmness and joy; instead, they create a state of internal negativity resulting in negative judgments and self-doubt. Anxiety, depression, feeling of distrust, etc. Continued stress that results from such relationships has a negative effect on the overall health of an individual; it affects both mental and physiological health damaging immune and endocrine systems as well as heart health. 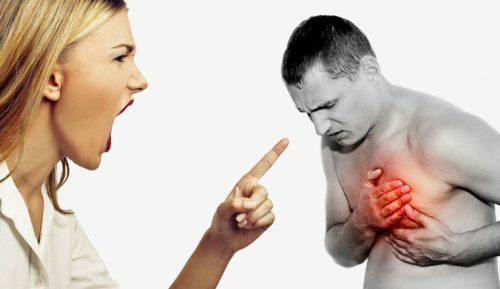 A study conducted between 1985 and 1988 tried to investigate whether negative aspects of toxic relationships can be linked to the worsening of heart health. Certain psychological factors including worry, depression, stress and anxiety provoked by difficult relationships between partners was taken into account. This study also considered such factors as the marital status, overall health (obesity, diabetes, etc. ), age and working conditions of the participants. Its results showed that certain people were more vulnerable to getting into toxic relationships than others, and that their health was highly affected by such relationships. According to another study done in 2000, women who reported stressful marriage were 2.9 times more likely to suffer from heart attacks, need heart surgery or die of a cardiovascular disease than those without marital stress. The study showed that unmarried women in toxic relationships had a higher risk of cardiovascular problems as well. High blood pressure. Stress provoked by unhealthy relationships triggers the production of the stress hormone, cortisol. Chronic stress results in elevated levels of cortisol which, over time, promotes blood sugar imbalance, rapid heartbeat, obesity, diabetes, constrictions of blood vessels and increased blood pressure. The combination of constricted blood vessels and high blood pressure can damage vessels and promote the formation of plaques, which eventually leads to a heart attack. High blood cholesterol. Being in toxic relationships creates a lot of stress and depressive thoughts as well as inhibits good sleep and raises the level of anxiety. All that can contribute to the formation of unhealthy eating habits. It is a known fact that what we eat affects the levels of cholesterol, so by choosing “comfort foods” to counterbalance the negativity of toxic relationships, we harm our bodies and thus promote the development of atherosclerosis. Takotsubo cardiomyopathy or broken-heart syndrome. It is characterized by the weakening of the left ventricle, which causes shortness of breath and chest pain. It most often results from a severe physical or emotional stress. This condition is sometimes called stress-induced cardiomyopathy and its symptoms can imitate those of a heart attack. Toxic relationships affect the health of the heart so negatively because of the way people behave in stressful and negative situations. When under chronic stress we tend to neglect our health by smoking or drinking too much, dwelling on depressive thoughts and eating poorly. Moreover, it is the replay of negative events in the head of an individual that affects the health of the heart. We tend to remember more the negative aspects of our relationships than the positive ones. Thoughts concentrated only on the bad things that happen to us can promote increased anxiety and anger levels as well as lower your self-confidence. Therefore, building harmonious and well-balanced relationships is important for good health and longevity. So, it is better to distance yourself from toxic relationships involving people who increase your levels of stress and anxiety.